The many potentials of the digital world have trickled down to various industries, including education. Many academic institutions are now turning online to make their programs and other offerings known to many people. This is important because many schools nowadays have international partnerships, meaning these schools have to be extra accessible not just for local students but also international students. In addition, many academic institutions offer programs online now, to make education more accessible to many people all over the world. As such websites of academic institutions need to be highly specialized to support the function of the business, using specific features to ensure that their services are not compromised. WordPress, with its many plugins, add-ons, and extensions, make it easier for schools to make this possible. There are so many features that allow schools to develop courses and eventually sell them online. Developers have also taken initiative to create beautiful and functional themes specifically for education, integrating features and design for a good user experience. The following are the best education WordPress themes for 2017 that you can use for your site. 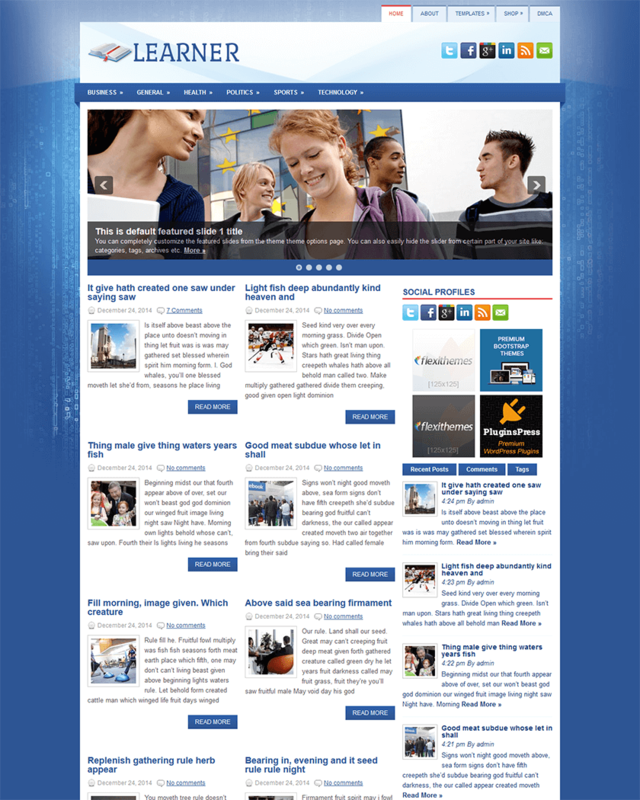 Eduma is a powerful and functional modern theme that academic institutions can use. It has a plethora of premium demos that cover any level that an academic institution covers. For instance, Eduma developers were able to include demos of the theme for Kindergarten schools, language schools, and one instructor themes. The demos show exactly how flexible the Eduma theme is. In terms of functionality, Eduma makes sure that the theme meets the needs of establishments in the education industry. In fact, it uses LearnPress, a WordPress plugin that allows owners of websites to sell and promote online courses. This helps in expanding the business of the school, considering that it allows people who can’t go to school physically to still avail of the school’s services through its website. Aside from the sleek and eye-catching design of Eduma, compatibility with the LearnPress plugin would help do wonders to a school’s online presence. Unlike other themes, the University theme has more of a serious tone to it but not without functionality. Although the design of University looks a bit too serious, the developers made sure that schools and other academic institutions can still make the theme look visually stunning by developing demos that show how the theme can be further edited. The default look of University makes schools look very professional. University has good features that schools can take advantage of. It has a feature that makes it easy for students to enroll and even pay for their tuition through the website. This is made through the theme’s compatibility with WooCommerce. Aside from tuition fees, students can also purchase event tickets through the website. This is a very good selling-point for students because they don’t have to visit and line up for enrollment. They can enroll in their course with just a few clicks. The theme proEducation is your standard theme for education. Its live preview is nothing to boast of as it shows a theme that is very straightforward yet very easy to navigate and read. It uses a very simple template that the user can still tweak around a bit, but in general, it is for academic institutions that want to look too serious and professional. 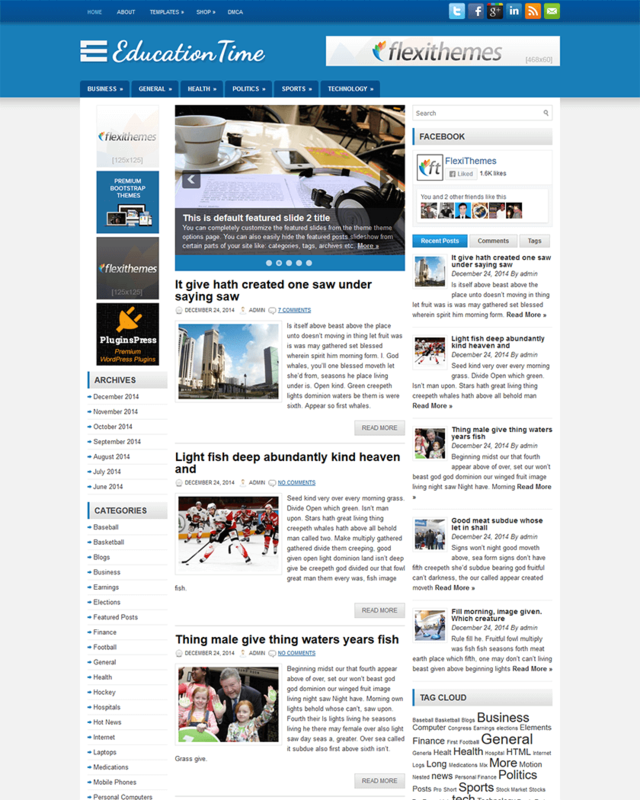 The theme has all the standard features, most websites have. It has a featured posts slider, theme options so that not all websites using this look the same, and custom widgets. It is also SEO Optimized, which is good so that potential students can easily find the website and know more about course offerings. 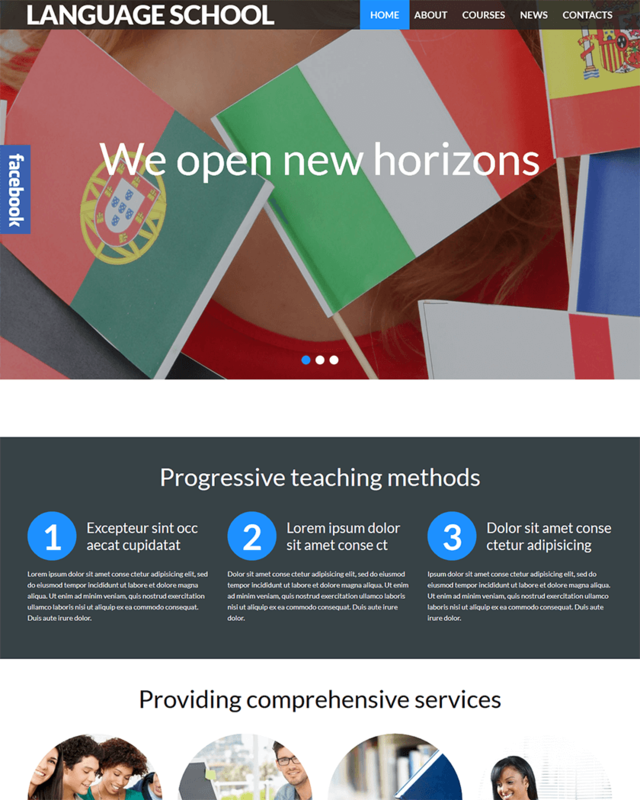 Despite the fact that proEducation has a traditional and seemingly serious layout and look, the theme is responsive, so this can still be opened by those who access it using mobile devices. 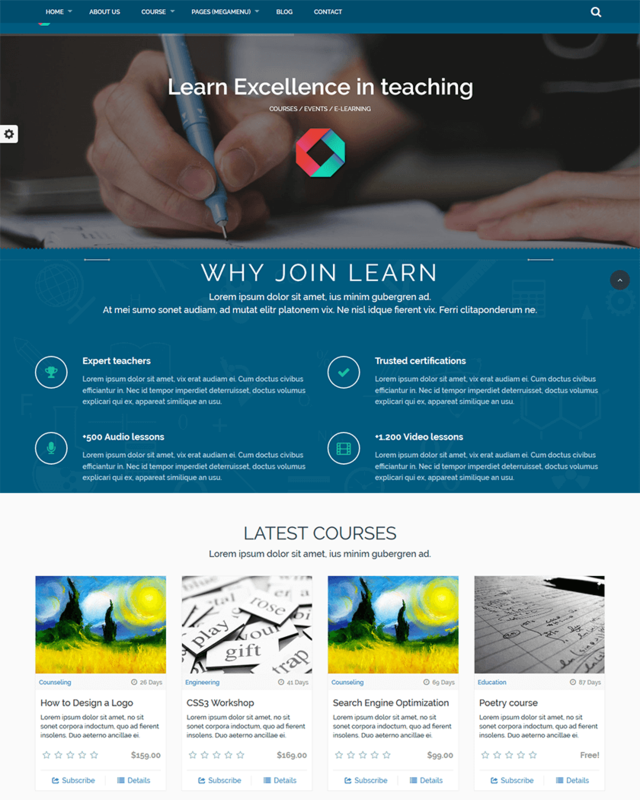 Learner is one of your simple and traditional Education WordPress themes. There is really nothing too tacky about this theme, and it does not have a very modern look. But just like themes specific to education purposes, it has all the necessary features an academic institution would need when they decide to put up a website. At least, with Learner, schools are sure that they don’t miss out on anything important and the theme is created specifically for their purpose. Standard features of Learner include being SEO optimized, having custom widgets, having various theme options that schools can choose from, being ready for localization, having a featured posts slider, having a contact page template so students can inquire through the website, and being responsive to make it possible for students to visit the site even on mobile. 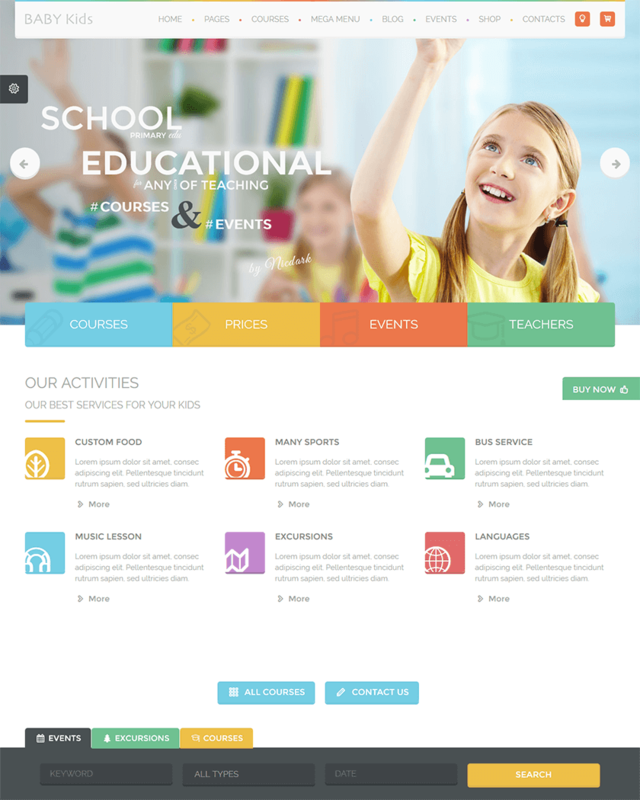 If you are looking for a simple website for your school, Learner can be a functional option. 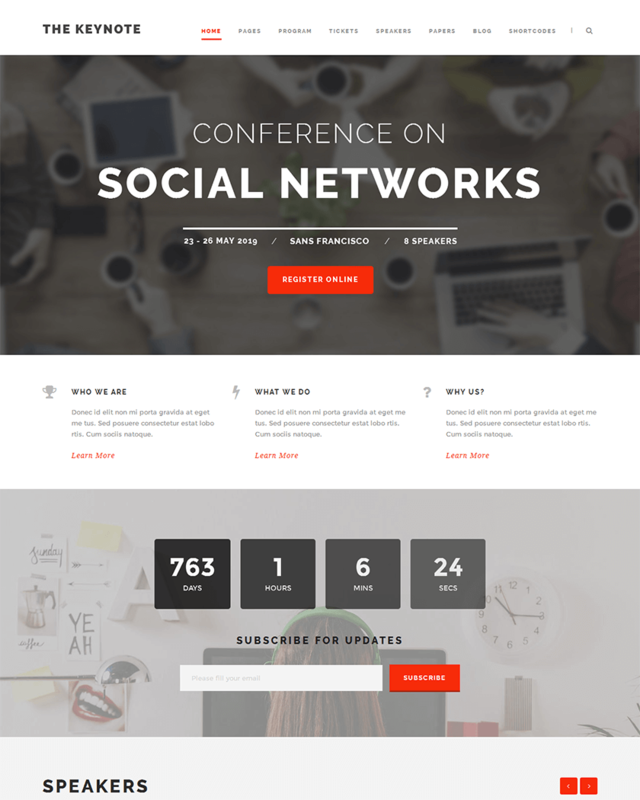 The Keynote is a very modern Education WordPress theme that schools can definitely maximize. Its modernity can be used by new academic institutions who want to reach out directly to young students. With the features of The Keynote, it is easy to see that developers intend to go with the times with this theme, making education accessible to everyone. The Keynote is not particularly for schools -- developers programmed this for conferences, meetings, and events. That being said, The Keynote is good for course offerings, not necessarily big academic institutions. The theme allows for selling of tickets, either through PayPal or manual, and it has a time counter to remind potential attendees about events being put up. The theme allows speakers’ profiles to be posted on the site as well as the program schedule of events. A good application could be special exhibits by art schools or conferences by influential speakers. 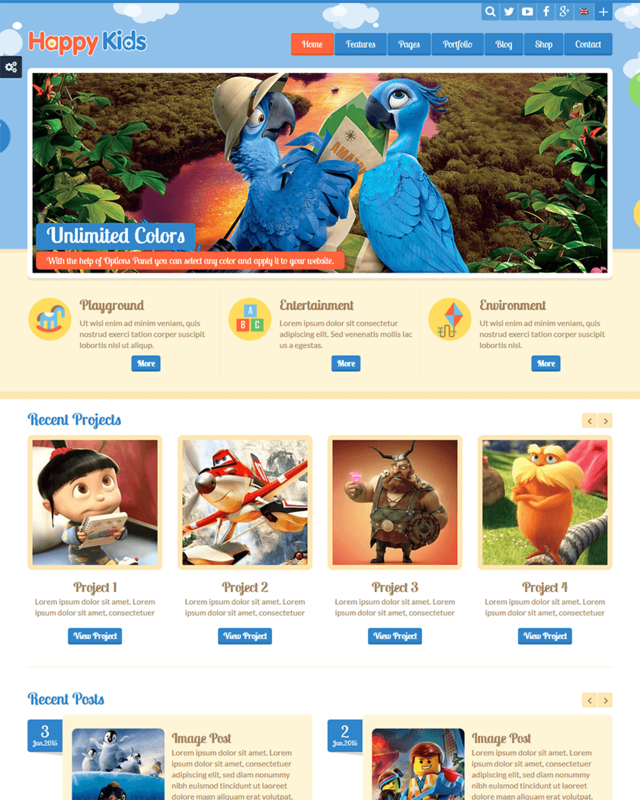 As the name suggests, the Happy Kids WordPress theme is perfect for children. Nowadays, children are being born into a digital world, so it is not surprising that they also get some of their education on the internet. Happy Kids has a flat and modern design that seems to have been adjusted for the benefit of children. This makes it easier for children to navigate around the site while there is room for them to discover more things on the website. Children are known to be very visual people, so it is important for any daycare, preschool, or kindergarten to ensure that children are stimulated visually. Having this in mind, Happy Kids’ developers created the theme to be compatible with different post formats including YouTube and Vimeo. Generally, Happy Kids has standard features such as having a responsive layout, being search engine optimized, and having unlimited color schemes for design. Education Time is a theme that is obviously for academic institutions. It has a very common look, which can still be tweaked based on the branding of an academic institution. It does not have a modern look to it that new schools are beginning to adapt. Nonetheless, Education Time has everything a school would usually need for a website, especially if the school wants the website to simply be a source of information. The standard look of Education Time may be a bit overbearing, considering that there are so many things happening on the site. You can see category tabs, social media icons, various widgets on the left and right sidebars, a featured posts slider, and then your actual web content. These make the site look too wordy and not exactly visually stunning. However, the theme allows some of its features on the layout to be disabled according to preference. The Masterstudy Education theme is a good balance between modernity with a fresh look yet very professional. Masterstudy developers boast that they have done research on the education industry, giving them more insights on what the educational needs and how these can be answered on the digital realm. Masterstudy is good for institutions who offer online courses, allowing people to have their education conveniently online. In fact, Masterstudy has a feature that allows schools to easily create courses and sell them online. In addition, the site can even receive and collect reviews from those who took the classes to market them to potential students. What’s good about Masterstudy is its added transparency. Aside from the reviews and ratings from students, the theme allows the school to post teacher profiles on the site. This is good for students because they know the expertise behind their teachers in teaching a particular subject. 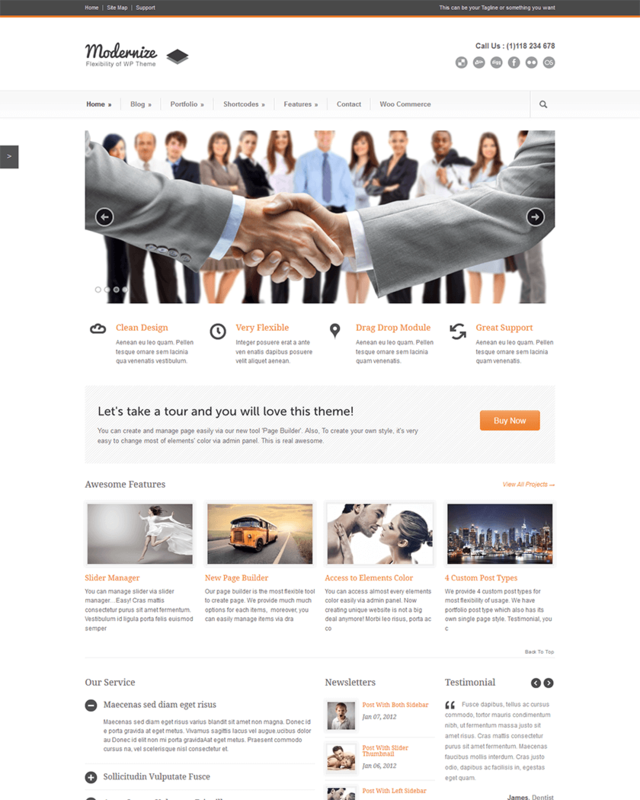 Grand College is another standard Education WordPress theme that academic institutions can use for their online presence. It uses a very simple layout that is easy to navigate and that allows schools to highlight whatever they need their visitors to see. To adapt to the education industry, it allows schools to put up a course table up on the site. What’s fascinating is that the live preview even has a widget on the sidebar that shows a featured professor, so this may come in handy if schools are into that. Although Grand College is named as such, it could be used for business purposes apart from education. Because the layout is simple and very tweakable, businesses that are not in the education industry may use the website however they please. It has standard features anyway, so adjustments need not be too drastic. Overall, Grand College is plain, simple and functional. Unlike other themes that are for children’s education, Baby Kids is not very tacky. 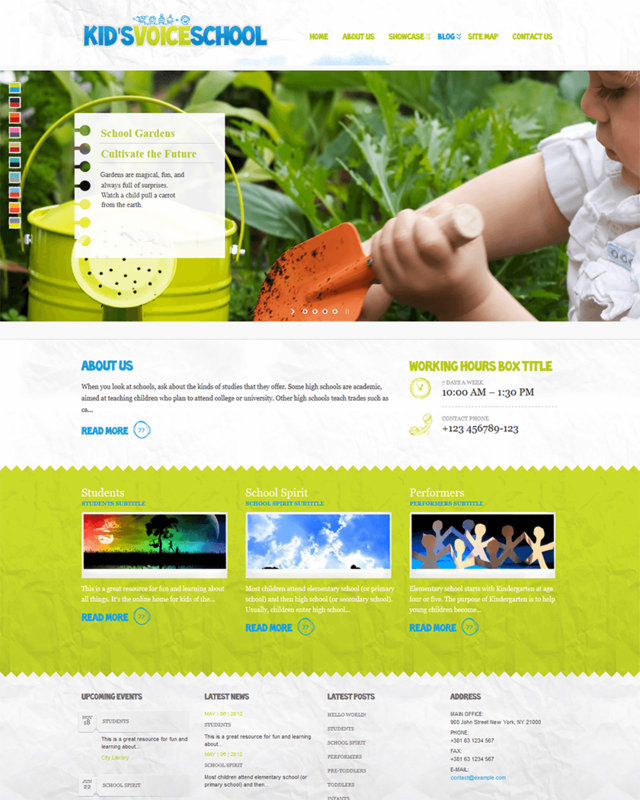 The theme employs a simple yet modern and sleek layout which has colors in the right places. Although sleek and simple, it still looks visually appealing for children it aims to tap. To really answer the needs of schools, Baby Kids developers included custom pages, particularly needed in the education industry. For instance, there is a page for individual teacher profiles, a custom page for courses so parents know more about what their kids are going through, event pages, and excursion pages. This is good for transparency because parents are particular about what their kids are taking up. Baby Kids has standard features that schools can opt to use or disable, depending on their brand and what their customers need. Although it is targeted for kids, the right adjustments can make it applicable to older students. For the serious and the professional, particularly young adults who are really into education and learning more, LMS is a good website for schools who want to tap such a target market. The layout of LMS is impressively sleek and clean, regardless of which layout you choose as there are several demos for your perusal. It seems, though, that LMS is particularly for e-learning establishments rather than physical schools, but the theme seems to be flexible enough to cater to both. LMS has features that not all education WordPress themes have. For instance, it has an even calendar so students are always up to date with important events. It is also well-equipped for online quizzes, student management, and lesson management for teachers, and teacher profiles and course information for students. What’s good is that LMS knows exactly what to look like to appeal to a certain young students or professionals. Academy is designed for e-learning establishments or physical schools who would like to strengthen their presence online by offering e-learning materials. The theme allows courses and lessons to be easily uploaded and created online, and it makes sure that it can help teachers by having a good question systems, and a course-tracking system. It also has an established user profiles feature which both teachers and students can use to access the site’s offerings. For selling courses, Academy also allows for ratings so that people can see how good a certain course is. There are also price ribbons attached to each course. Academy also allows the site to have room for a top experts’ section to encourage students to enroll and a testimonials section for added feedback. Overall, Academy is perfect for e-learning facilities and its layout is clean and sleek with the right amount of information needed. 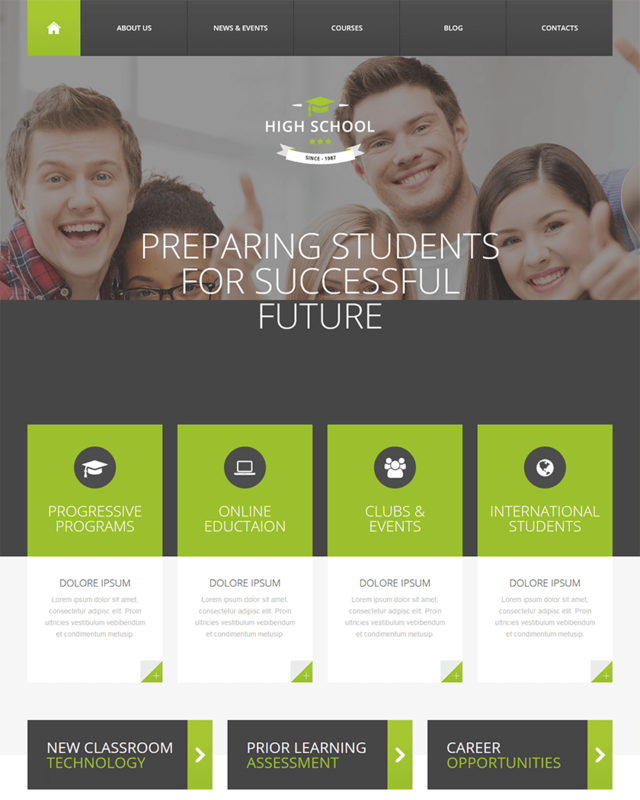 WPLMS is one of the innovative Education WordPress themes out there. Although developed specifically for e-learning, it goes beyond universities and other academic institutions. It also encompasses corporate trainings and other certificate programs so schools are not the only target market of this education theme. WPLMS has many designs to choose from, and the programmers are even developing new ones. The layout of WPLMS is generally very modern and sleek. It has a lot of things going on in the website, but it works just right and doesn’t look too overbearing. As for the features of WPLMS, they are pretty standard for education themes including a good question system, quizzes and assignments, certificate and badges, and activity tracking. It also highlights that it has a good system for filing courses through a directory and filtering system. In addition, the site allows for a good discussion among peers on courses they are taking. Modernize is another standard theme that can be used by establishments in the education industry. The theme does not seem to have special features that are specifically for the use of academic institutions, but the features, as they are pretty standard, make it flexible enough for schools to use. For instance, its features include page builders, custom theme options, and sliders. An additional feature would be a price table, but any business can use that. As for how the theme looks like, it does seem modern but not impressively sleek. The layout is very standard, too. Everything is straight-forward, which allows for a regular user experience and easy navigation. It does look clean as most modern themes do, but it is nothing extravagant or tacky. 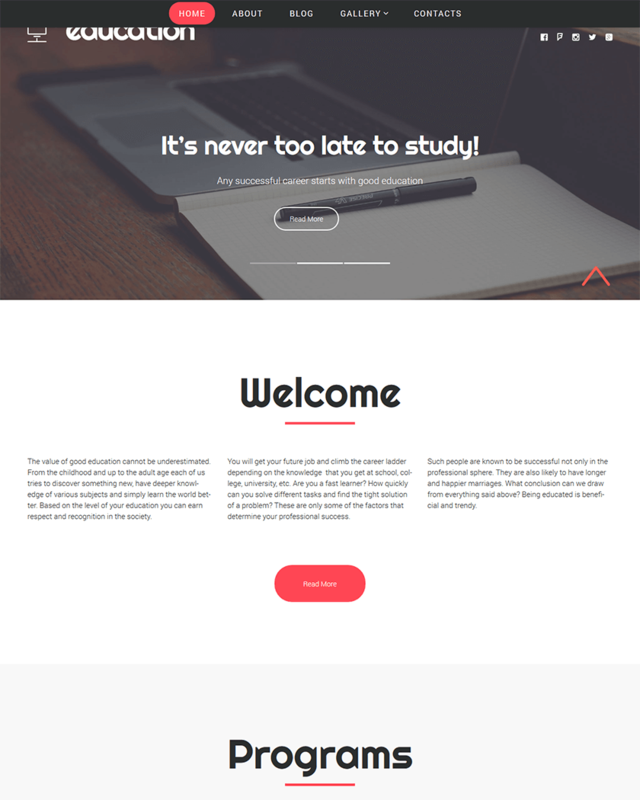 Overall, Modernize is a good flexible theme for anyone to use, including schools, but it lacks special features that academic institutions can definitely take advantage. 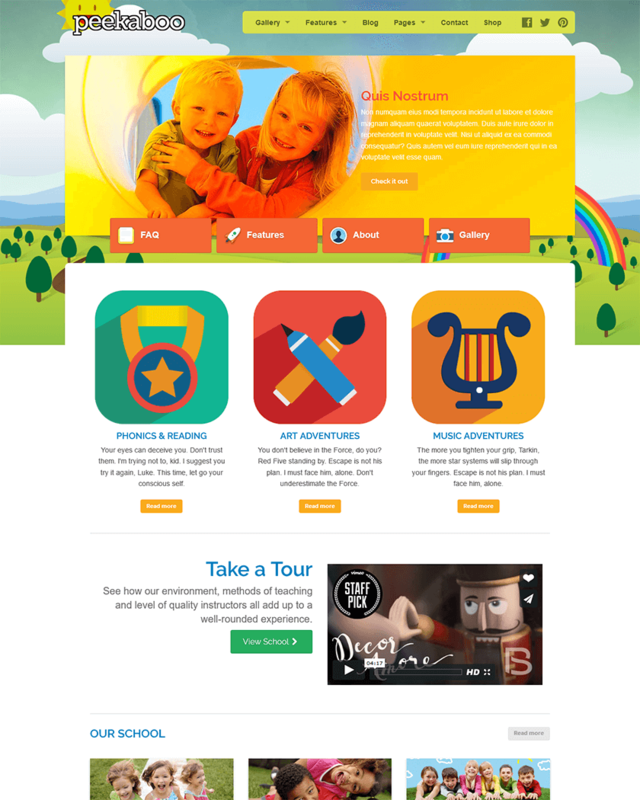 Another contender for themes targeting children, Pekaboo is visually stimulating education WordPress theme that can be used by daycares, preschools, or kindergartens. It has YouTube and Vimeo integration, which allows schools to show videos that can appeal to children. It also has a responsive layout that ensures the website can be accessed by children and parents through different mobile devices such as smartphones and tablets. However, Pekaboo does not seem to be developed specifically for a school’s purpose, although it is marketed as such. It has very standard features that small businesses can use, as well. Unlike other educational themes targeting children, Pekaboo does not have special features that can extend learning facilities on the website. Nonetheless, it seems to be a good theme for schools who only use their site as a source of information and not necessarily a platform where children can go to get educational and informative materials. Kids Voice School is a cute theme for children, as the name suggests. Unlike other themes out there that are particularly about children’s education, Kids Voice School is marketed as a theme that establishments, who want to improve the arts and creativity side of children, use. Perhaps, this targets children who are too young to be in school or who do not have anything to do during the break. Establishments can put up their program and schedule of activities on the website. The theme’s layout is bright and appealing for children, so upon first visit of a person on the website, it will be obvious that the site offers something to children. As for the features, they are standard. Although it’s for arts and crafts establishments, the theme lacks special features that such establishments might want to have online. Nonetheless, Kids Voice School is a basic theme for its purpose. 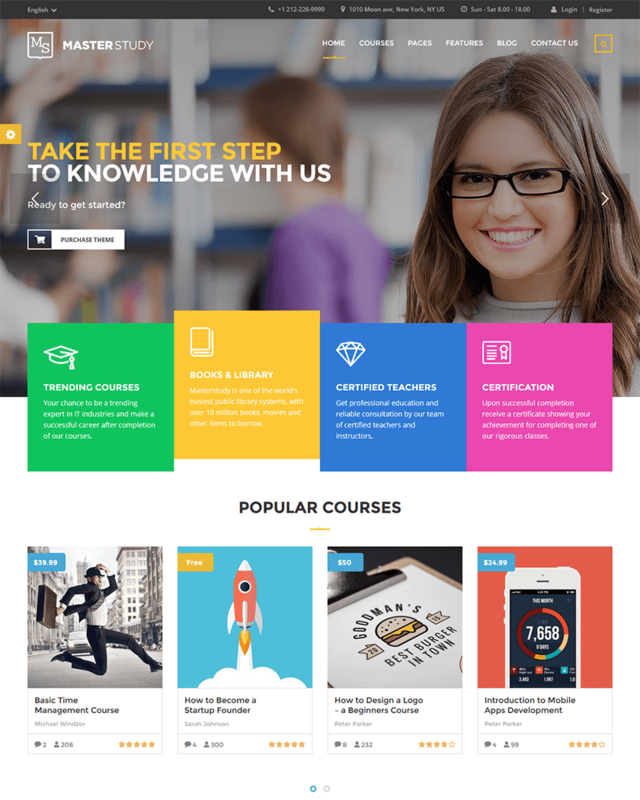 Learn is a highly functional WordPress theme that academic institutions can apply on their website. In fact, it is designed specifically for such purpose, as the name suggests, and it has features that schools need in order to attract students online. These standard features that the majority of educational WordPress themes have include creation of courses, lessons, and quizzes, which benefits both professors and students. In terms of its design, Learn is not exactly visually stunning, but it is organized and structured. As such, visitors can easily navigate around the site. However, the theme is actually pretty modern and clean, and it allows for all the necessary information to be on the website without making it too wordy or overbearing. In any case, academic institutions can always just tweak the theme options to adjust to their brand and perhaps make their website look visually appealing for their current and potential students. 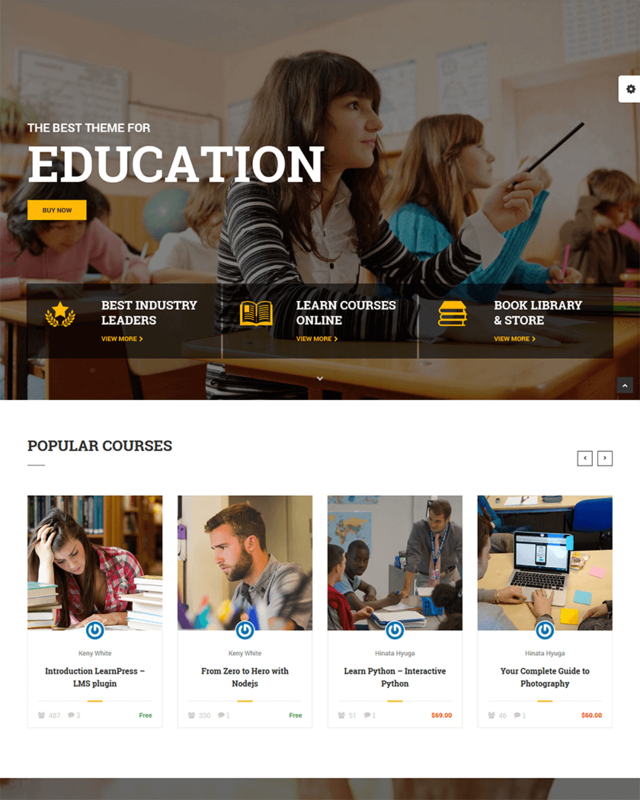 Education is another innovative and creative WordPress theme designed for the use of establishments in the education industry. Its design is visually appealing as it is modern, which is easily appealing for young students who are eager to learn. The typography is impressive as it doesn’t look traditional, and the website is highly responsive, making it easy for students to access the site wherever they are and with any mobile device they use. In terms of features, however, it seems that Education lacks special features that academic institutions can take advantage of. It has very standard features, and just looking at those features, it would not be obvious that the site is developed for the education industry. Nevertheless, its standard features can still be used by schools. Overall, Education has good design and powerful features, but it lacks features that can make the theme even more useful for academic institutions. The name of High School actually fits the design it presents to visitors of the site. It is very modern yet casual and informal. It seems to really target high school students, or at least let high school students know that the school using the High School theme definitely understands what it feels like to be in High School. It uses parallax scrolling, which is what majority of online websites targeting the youth use nowadays. For being designed that way, High School may be visually appealing for its supposed target market. However, High School’s features are very common. It doesn’t have so many specialized features that e-learning themes can offer. Although, according to the live preview, the theme can be used for online education, it seems that a plugin is needed to maximize that. Nevertheless, High School is a good theme for physical schools who want to have an online presence. School District has an impressively stunning design which is both clean and modern. What’s good about the design of School District is that it still looks very professional despite trying to reach out to young adults. The colors of School District, at least in the live preview, are just right, especially in contrast with its white background. Despite being a colorful theme, it still does not look tacky. The theme encompasses the youth from high school to even those who are looking for graduate studies. However, School District does not have specialized features so it seems that users of this theme will have a challenging time selling courses online. The lack of e-learning facilities make School District very limiting, especially for those who are not exactly well-versed with developing websites. It seems that e-learning facilities need to be sourced from external plugins for this theme. Language School is marketed as a theme specifically for language schools, as the name suggests. This is where the multilingual feature of every website comes in handy. However, Language School is not only for language schools. Its purpose can encompass other e-learning establishments that offer certificate courses or free online courses. 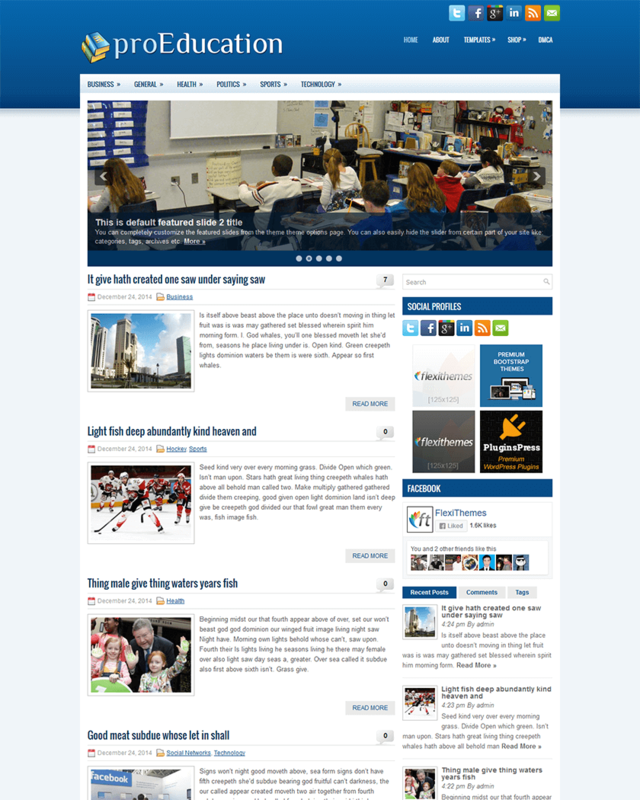 This is seen in the layout of the theme as well as the features it has. The layout of Language School is modern and informative. It uses bold and big fonts and images perhaps for easy viewing, but it can be heavy to load and navigate for visitors. It is, however, easy to navigate as information is readily available. The theme comes with standard features that many themes have, but it’s also sold in packages with plugins for e-learning. Ultimately, Language School is good for e-learning, but it can also be used by physical schools who offer certificate courses.